The two are very similar, but are not the same. If your unit specifies one or the other stick with the OEM reccomebdation. Identical. AW is an American designator, ISO is an international designator. It's the 46 part that makes them the same viscosity, which puts it in the same viscosity range as 20W engine oil. The higher the AW/ISO number, the thicker the fluid. I beg to differ Greg, but "AW" stands for "Anti Wear" and means it contains certain additives and such. "ISO" stands for "International Standards Organization" and refers only to the fluids viscosity, and by specification is free of additives. "SAE" is the equivalent of "ISO", not "AW". The way you worded that Murf makes it seem like ISO-labeled hydraulic fluids have no anti-wear additives, which is seldom true. Click the example below to see what I mean. This product is called AW150, but the 150 has nothing to do with the viscosity. Their AW150 comes in ISO32, 46. and 68. Other companies shortcut that labeling method and simply label them as AW32 or 46 or 68 or 100, which equates them to the respective ISO viscosity. 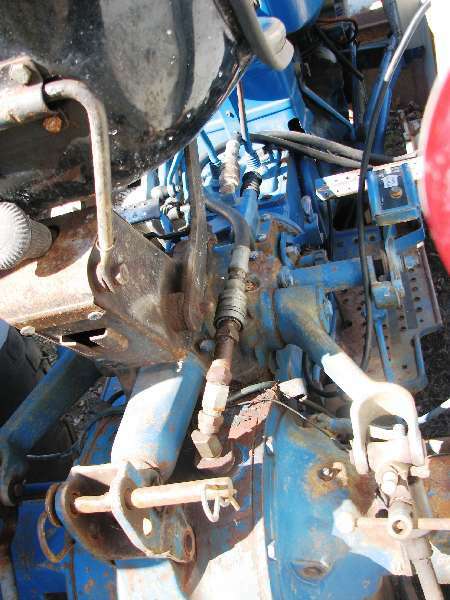 Tractor hydraulics aren't that particular that they'd know the difference. So - in dual sump tractors - I personally used AW32 and ISO32 labeled hydraulic oils interchangeably. Single sump tractors don't use either. They use UTF, which isn't conspicuously labeled as either AW or ISO. Now that I reread my post I can certainly see where there could be confusion. That was not my intent at all. What I meant to say was that a particular ISO standard only specifies viscosity and density and a few other lesser standards. It does not require anti-wear additives in order to meet the given spec. but that is not to say a particular ISO-rated oil doesn't contain any. Also, the ISO number does not reflect the viscosity the way we're used to with motor oil. AW oils on the other hand do contain additives in order to just meet the standards. The potential problem is, as you touched on, in single versus dual sump applications there could be clutches or brakes that may be affected by certain additives. Which is why I'm careful to use the word "equivalent", and stated that the higher the number, the higher the viscosity. For example, AW32 has a viscosity equivalent to 10W engine oil. AW46 and 68 are in the 20 weight range. AW/ISO100 is about 30 weight. The most common viscosities are ISO22 (arctic) through 220 (turbine). Extreme condition/specialty fluids are numbered as low as 5 (sub-arctic) and as high as 300 (not sure).